A Comic-Con Diary, Day Zero: A Nervous Man Ponders A Bag Of Sharp Objects Our correspondent Glen Weldon tracks his path to Comic-Con, from nervous departure to the first glimpses of his people aboard a flight to San Diego. 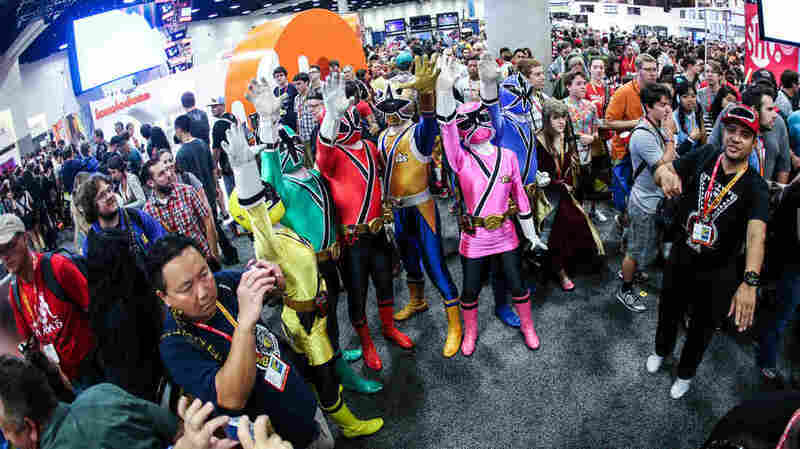 This is actually a picture of some Power Rangers from last year's Comic-Con, for reference. Dear Glen: Just pretend all these people are hugging you at once. Sincerely, your editor. Glen and F's Apartment, Washington, DC. 4:00 a.m. ET: Alarm goes off. 4:05 a.m. ET: Alarm goes off. 4:10 a.m. ET: Alarm is like, "Hey. HEY. HEY JERK." 4:11 a.m. ET: Arise, grudgingly. Shower, grudgingly. Get dressed, grudgingly. You know what? It's 4:11in the morning, so you can pretty much just add ", grudgingly" to the end of every sentence from here on. It'll save me a little time. 4:25 a.m. ET: Final check before getting in cab. Laptop? Check. Tablet? Check. Phone? Check. Digital voice recorder? Check. Cords to connect the above to one another in various Byzantine ways? Check. Chargers for all of the above? Check. Backup chargers? Check. Backup to the backup chargers? Check. Clothestoiletriesshoesblahblahboringtravelstuffwhatever? Check. Bag full of pointy, pointy lapel buttons? Well, of course that's the question of the whole morning. Do I check these buttons, or can I carry them on the plane? A bit of background: I am flying to San Diego Comic-Con for the first time. I have attended several comics conventions, but nothing like the sprawling 130,000-plus-attendee transmedia cross-platform clusterfest of hypermegalosynergistic promotion that awaits me at the San Diego Convention Center. For the past few months I've been nervously joking with SDCC veterans: "It's pretty much like the Small Press Expo (an annual gathering of indie/art-comix creators and devotees I've attended for years), right? A bunch of beardy, fixie-bike guys and eye-linered Betty Page girls talking soberly about the linework of Tony Millionaire and Kolbein Karlsson, right?" Wrong. "You'll see," they say, and sink into a reverie, gazing fixedly into the middle distance like a hard-bitten 'Nam vet at an American Legion spaghetti dinner. My habit, when going to conventions (and when going, you know, anywhere) is to hang back and observe. And were this any other year, and any other convention, I'd probably stick to that plan. But there are a few things that are forcing me out of my shell and into the Great Nerdy Scrum of Humanity, Robotity and Ewokity. 1. I've got a book to shill, and where better to shill it than Shill Central, the Great Geek Shillodrome, The Big Shill, Shillapalooza? My book, Superman: The Unauthorized Biography, came out in April, and sales have been neither underwhelming nor overwhelming. They are, instead, whelming: plainly, resolutely and unremarkably whelming. This year is Superman's 75th anniversary. I'd applied for an official SDCC panel with Brad Ricca, author of the great new book Super Boys (a beautifully written bio of Superman's creators Siegel and Shuster and their legal and financial struggles with DC Comics), and Mark Waid (legendary comic book writer, editor, and Superman expert non-pareil), but we were rejected. This year, the only Superman celebrations at SDCC are hosted by his corporate overlords, DC Comics. More on this later. Without a pre-set place and time to hawk the book, my original plan to send a bunch of copies to the hotel doesn't make much sense. Can't imagine I'll find a lot of opportunities for ad-hoc book-hawking, or — given that I won't have any hard copies on hand — many takers. I am great at marketing. 2. I've got a book to research. My next book is about the rise of nerd culture, and Comic-Con is nerd culture in ... it feels funny to use the term "microcosm" when speaking of this particular media event, but there you go. My plan is to comb the con floor and stalk the panel discussions looking for SDCC long-timers to interview, folks who have seen the show metastasize from what it was in 1970 — an opportunity for 300 fans to paw through some back issue bins in a hotel ballroom and meet Jack Kirby and Ray Bradbury — to what it is today. 3. You, dear reader. I'm hoping that all that aforementioned research will help me bring a wider historical context to my coverage of the con for NPR. Oh, there'll be photos of cosplayers, never fear. Trust me, I'll be the Tom Joad of hot dudes in spandex. ("Wherever there is a bare-chested Hawkman, you will find me... Wherever there is Kraven the Hunter, I'll be there.") And I'll try to provide a sense of the upcoming movies and shows that people on the floor are excited about. But you can get that kind of coverage anywhere. What I'll look for, in this diary, is the scrappy little comic book convention hidden inside the exultant corporate branding workshop that is Comic-Con. I'll be asking people I meet what books they love that not enough people know about. I hope to come away from the next four days with a list of books and series to get excited about. 4. It's maybe time to get over my damn self already. I've gotten to be Twitter-friendly with several people who'll be at SDCC, and I hope — in stark defiance of my ingrained, muscular, weaponized form of introversion — to meet them in person, and buy them a beer or six. To force myself to engage with others while I'm at SDCC, I've decided to take two hundred or so Pop Culture Happy Hour ... buttons? Lapel pins? You know those metal dealies you stuck to your backpack, back in the day? Those. I'll hand them out – A CON EXCLUSIVE!!! (say, maybe I'm good at marketing after all?) – like Johnny Frickin' Buttonseed. 4:45 a.m. ET: These buttons are awfully pointy. They're basically 200 elaborately decorated needles. Or if you prefer: 200 tiny, tiny pikes that may not, given their size, be considered "deadly." "Ouchy"? Oh my yes. "Deadly?" No. So: Can I carry them on the plane? We're really really trying not to check any luggage. The thought of waiting at a baggage carousel for a bunch of lapel pins fills me with a very specific form of sadness which is only the latest aspect of my life that would be impossible to explain to my grandparents. Last night we asked Twitter what to do. Twitter said, "That would raise eyebrows!" Twitter said "Don't risk it." Twitter said "Mail them to your hotel room!" We called the airline. "Put them in a clear plastic baggie, and have it go through the x-ray machine alone," the airline said. "Should be fine." But then, the airline also said the plane will be on time. So. I mean. Pound of salt, you know? Regardless! We're taking them in a carry on bag! Because we're LIVIN' ON THE EDGE! 4:50 a.m ET: Walk the dog, who'll have a longish wait until the dogsitter comes. The dog attends to his morning ablutions. Groggily. Grudgingly. You and me both, pal. 5:15 a.m. ET: In the cab! On the way to Comic-Con! Wooo! Flight's not till 6:30! Plenty of time! Using the boarding pass app on our phones! Wooo! 5:35 a.m. ET: WHY ARE THE TRAFFIC LIGHTS SO LONG AT THIS TIME OF THE MORNING THERE'S ONLY LIKE MILKMEN ON THE ROADS RIGHT? YES THERE ARE SO STILL MILKMEN AROUND SHUT UP. 5:40 a.m. ET: OKAY WE GOT IT. Now please hurry. It's going to be tight. 6:00 a.m. ET: Airport. More anxiety: I watch the bag of Pop Culture Happy Hour lapel pins disappear into the maw of the x-ray machine to bathe in roentgens – and in the baleful gaze of a security professionals. 6:15 a.m. ET: The gods are merciful, and brand-conscious, this day. The PCHH pins make it through. 6:20 a.m. ET: As we board, I inspect my fellow passengers, expecting to catch knowing looks from fellow members of my nerdy tribe. .... Nope. This flight doesn't go straight to San Diego, though. We're going to change planes in Minneapolis. Nobody looks like they're SDCC-bound. Unless they're cosplaying as Jim Gaffigan. 9:15 a.m. ET: Leaving Minneapolis; headed to San Diego. If we stay on time, we should arrive at 11:00 a.m. Pacific Time. We will head to the hotel, where F will meet some friends from Miami, and do outdoorsy vacation-type things in San Diego, the chump. I, on the other hand, will coordinate with Maggie, head to the Convention Center, get my press pass and wait in line for the floor to open for "Preview Night" at 6:00 p.m. I look around the plane. Okay. HERE's my people: Two young women ahead of us carry Doctor Who Cabbage Patch Dolls (Four and Eleven, for the nerds among you) as they chat animatedly about Batroc the Leaper. Across the aisle, a lean and hungry dude clutches his portfolio worriedly. The six-year-old behind me ticks off the Thursday schedule for Hall H from memory. The floor won't open for hours. But Comic-Con has begun.